President Jacob Zuma and First Lady Tobeka Zuma flanked by Rebecca Kotane (right) and Mary Marks during the formal reception ceremony. TWO of Mzansi’s struggle giants have come home. 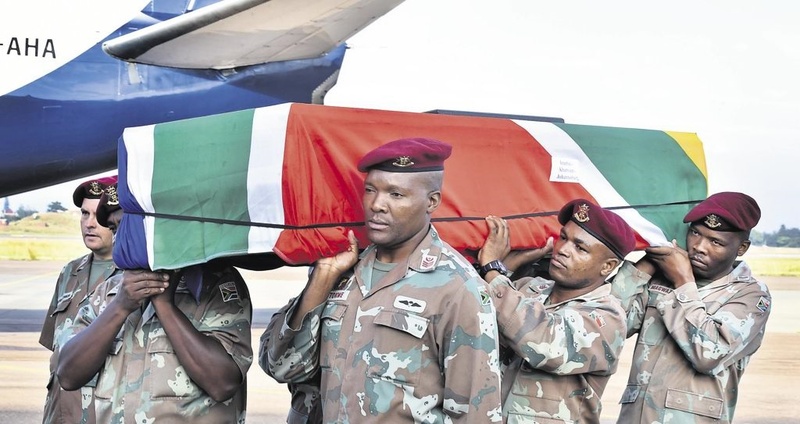 These were the words President Jacob Zuma used to describe the return of the remains of struggle heroes Moses Kotane and John Beaver Marks, known as “JB”, nearly 50 years after they died. Zuma was speaking in a ceremony at Waterkloof Airforce Base in Tshwane yesterday. Zuma hailed the two as giants who played a critical role in the liberation struggle. Zuma said they had also shaped the thinking, policies and revolutionary direction of alliance partners. He thanked Russia, which buried the two men in one of its most prestigious graveyards in Moscow. The two coffins were escorted by a guard of honour in the Russian capital. “The Russians are true friends,” Zuma said. He urged South Africans to remember this: “Maybe we have forgotten, because we have new friends with a lot of money,” he said. Before his address Zuma entertained mourners who joined him to sing Ngomhla Sibuyayo, whose lyrics say “the day we came back, there was happiness”. Kotane’s widow Rebecca (103), dressed in black, sat next to Zuma. JB Marks served as president of the ANC’s Transvaal branch. He was elected chairman of the SA Communist Party in 1962. In 1963 he went to Tanzania and died of a heart attack in Moscow in 1972. Kotane was secretary-general of the SACP from 1939 until his death in 1978. He was chosen to study at the Lenin School in Moscow. A memorial service will be held for the two in Gauteng. Kotane will be laid to rest in Pella and Marks in Ventersdorp, North West.